Grace is dangerous and risky. It could lead to misuse and license: “Let us sin that grace may abound!” The Apostle Paul new of this danger and wrote extensively on it in several of his letters (e.g. see Romans 6:1-7:25 and Galatians 5:1-15), and we do not have space here to present a major treatise on this amazing subject of Grace (and there are many scholarly works available to peruse). But what I do want to present is the Hope of this dangerous Grace…. The hope? When we do fall, this dangerous Grace is all-sufficient for us to get back up and keep on walking in the Spirit in the steps of my Savior. We do not take this dangerous Grace lightly. We are fully aware of the price paid of the lavished Love flowing from such all-sufficient Grace. Yes, I could take it for granted, and continue wallowing in the muck and mire of my flesh—my sin, but the Love Lord Jesus has lavished on me somehow propels me to step out of the miry clay and have my feet firmly placed on the Rock that is higher than I. His dangerous Grace is faithful to forgive me when I confess my sin and cleanse me from all that muck & mire…. It is all-sufficient. So I rest in the hope of this dangerous, all-sufficient Grace. The hope that gets me back up when I fall; the hope that a confessed sin is not only forgiven, but replaced with heaven’s righteousness; the hope that my feeble steps behind my gracious Master are strengthened by His dangerous Grace. Does this hope spur you to get back up and drink in His never-ending all-sufficient Grace? Your thoughts? Main Text— 2 Corinthians 12:7–10 (NIV)— 7 Therefore, in order to keep me from becoming conceited, I was given a thorn in my flesh, a messenger of Satan, to torment me. 8 Three times I pleaded with the Lord to take it away from me. 9 But he said to me, “My grace is sufficient for you, for my power is made perfect in weakness.” Therefore I will boast all the more gladly about my weaknesses, so that Christ’s power may rest on me. 10 That is why, for Christ’s sake, I delight in weaknesses, in insults, in hardships, in persecutions, in difficulties. For when I am weak, then I am strong. Heavenly Father, I am humbled by this amazing, dangerous Grace. I know I am not worthy to receive this, but Your Love for me has made me valuable. You Loved me even when I was Your enemy. Lord Jesus, I praise You for Your sacrifice of Love and Grace. No words can truly capture my heart’s gratitude. Baruch Ha Shem Y’shua! Amen. Probably one of the most difficult things about a God, Who is Love, is to reconcile His Wrath and Judgment. It goes something like this: “How can a loving God send people to hell,” or the like. And before we quickly dismiss this, we truly must engage the challenge. How can a loving God do this? Obviously, treatises and tomes have been written attempting to resolve this conflict. I cannot pretend to say I have read them all or even a near majority. But what I can offer in this brief blog, is a Both/And response to an Either/Or Dilemma. God is either severely wrath-filled and vicious or He is completely Loving and forgiving: This is the general framing of the conundrum. But I want to submit that a Holy-Love God can express both wrath against evil and Love toward Good at the same time. The problem comes when we reduce the LORD to a human parent, whose fickle punishment and discipline have scarred many for life. Our God’s wrath is neither capricious nor reckless. The main verse notes that an essential element of His character is patience: He “is slow to anger.” But He is also “great in power”. His anger/wrath when executed is not out of control, thrashing about like a drowning swimmer. No, rather with pinpoint accuracy the LORD punishes the wicked, who refuse to repent, thus protecting His own, who have been cruelly treated by the wicked. This is true justice; Holy Love…. How slow was He to anger? Well, with the people of Noah’s day, it appears He waited 120 years (not counting the many years before Noah) before He executed judgment. And when He did, His Holy-Love spared Noah’s family. (I hear the book is better than the movie.) Another example of our LORD’s slow to anger is with Assyria. After they repented from their wickedness under Jonah’s reluctant preaching, the LORD spared them, on the low end, 120 years as well, before His Holy-Love destroyed the wicked nation for its sorcery, idolatry and violence, but yet protected His people, Judah…. Beyond the theological conundrum and the personal struggle with a God Who is Holy-Love, at least two questions need to be addressed: (1) How does this change my view of disciplining my children? and (2) Where does the cross fit in here? When considering the cross, I see the welding of God’s Holy-Love with Grace. I’m reminded of a sandwich quarter: Holy and Love are the two precious metals on the outside, but welded in the middle is another precious metal: Grace. Beyond the mystery of God, the trinity, etc., I find this fascinating. It was on the cross where the Love of God was demonstrated (Romans 5:8) and, at the same time, I see God’s Holiness express in the sacrifice, the required payment for sin—all sin. And I see the Grace proffered all people, so they do not have to receive the pinpoint wrath of an unrepentant heart. What are your thoughts on this rather heavy subject? Main Text— Nahum 1:3 (NIV84)— 3 The LORD is slow to anger and great in power; the LORD will not leave the guilty unpunished. His way is in the whirlwind and the storm, and clouds are the dust of His feet. Lord Jesus Christ, fill my heart with Your Holy-Love so I may graciously discipline those under my care. In Your Name, Amen! As we enter Day 6 in this month of corporate fasting coupled with our Solemn Assembly and Heartwork, we are encouraged in the Heartwork Devotion for today to “Unlearn Our Culture.” The way I see it before I am able to learn something new, I need to unlearn something “old.” And before I can unlearn something “old,” I need to identify the old as being out of sync with the Word and Jesus’ Heavenly Culture—no matter how much I have baptized it or relabeled it or PC’ed it, eh? This rethinking actually requires that I stop and think. Ouch! Then I ask the Lord Jesus Christ to reveal to me by His Spirit those ‘things’ (such as, habits, thoughts, attitudes, passions, etc.) that are displeasing to Him. We may be surprised to learn that some of these “things” may be rather “good” things. But because I have been infected by the culture around me, I have made them an ‘idol’ or have engaged ‘them’ in my own strength. In this way I have tarnished a ‘good’ thing…. But, we may also find that we have been deceived or even deceived ourselves into thinking that this habit, thought, attitude, passion, etc. is, in fact, justified, warranted, and simply Okay. “I have a right to….” You can finish this sentence. But as the Light of His Word and Holiness concussion us, we are first blinded to the Truth of our deception, maybe even to the point of being defensive. But once our spiritual eyes become adjusted to the Holy Light, we see clearly the distinction between Truth and Deceit. This can definitely lead us to a ruining, a wrecking, an emptying, an undone state of life. Some times I fall into verbal self-flagellation where I bemoan the fact that I have been so naive, so stupid, to have been deceived so. Once I snap out of this, I am able to thank the Lord Jesus for being merciful to me to end this deception. Here then begins the transforming process of unlearning the culture! 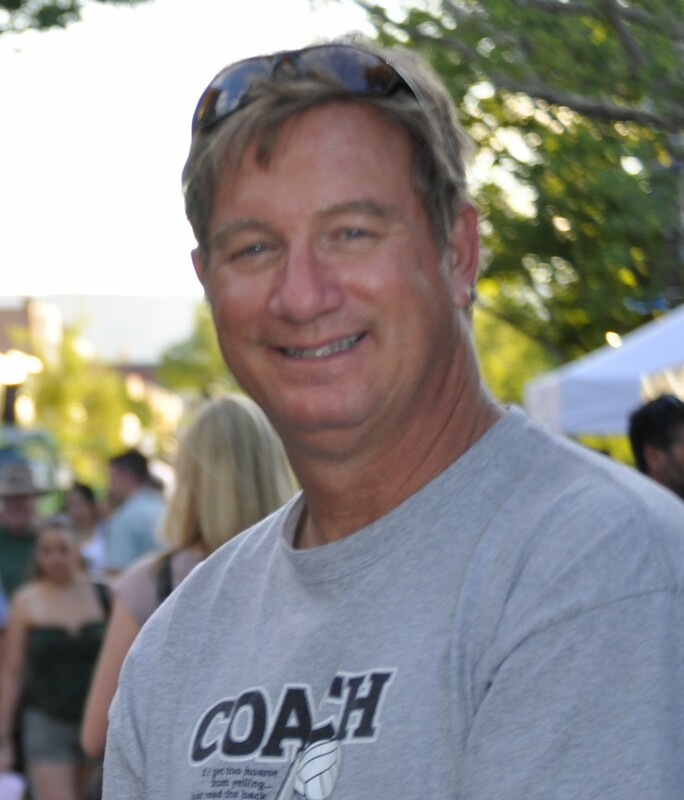 And it all started by rethinking…. Are you courageous enough to join me. I wasn’t—not at first, and without the Lord Jesus being my courage, I would not have gotten this far. How about you? 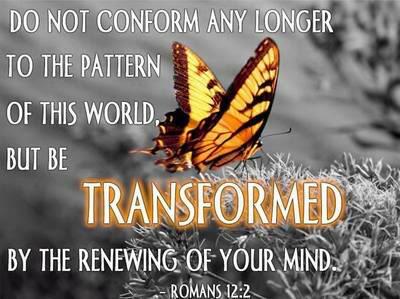 Main Text: — Romans 12:2 (NIV84)— Do not conform any longer to the pattern of this world, but be transformed by the renewing of your mind. Then you will be able to test and approve what God’s will is—his good, pleasing and perfect will. Heavenly Father, strengthen my feeble arms and weak knees. Empower me by the Lord Jesus Christ’s Presence thorough His Holy Spirit to reject those cultural ‘bad’ habits, attitudes, thoughts, & _____. Lord Jesus Christ, be my courage as I turn from these ‘things’ that so displease You and pursue You along with those who call upon You out of a pure heart. In Your Love and Great Mercy, Amen. Many believe that the LORD is going to judge our nation for its immorality and debauchery. If HE is going to judge our nation, judgment starts with His house (see 1 Peter 4:17 NASB95). But if we judge ourselves, then perhaps the LORD will spare this nation as He did Nineveh those many years ago (1 Corinthians 1:31 & Jonah 3:1-10). To merely judge ourselves is not enough, i.e., “Yeah, we’re doing something wrong. So what?” Once we judge ourselves, we then repent of whatever is displeasing to the LORD. Thus, repentance is the key. One way to act on this pattern of repentance is to join our church with fasting in the month of October. We begin our fast with an observance of the Day of Atonement (Yom Kippur). This year it is September 23. 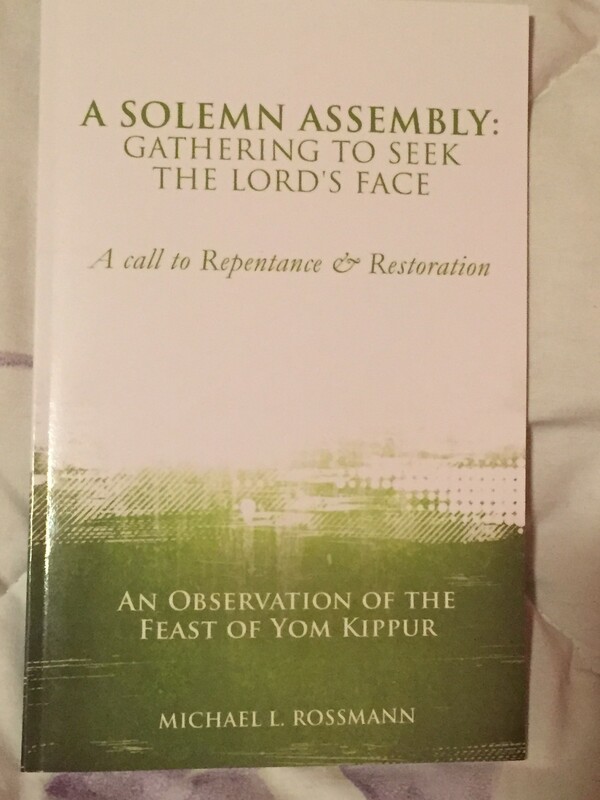 We use a ceremony I have had published in the Book, A Solemn Assembly: Gather to Seek the Lord’s Face (A Call to Repentance and Restoration). This book is a collection of scriptural prayers that will assist any follower of Jesus on his/her journey to repentance and restoration, let alone our daily walk. Thus, this book can be used for personal devotion as well as small group or large gatherings. Though you can repent without any formal plan or ceremony, many have found it helpful to use a more formal tool in their own observance. Further, I note in the 2 Chronicles text that is plural: “If my people.” Truly repentance is a personal and private matter, but also we, as the Body of Christ, can join with our brothers and sisters in corporate repentance as the Israelites did in days of old. I am presenting this book as a tool to all the People of the Lord Jesus Christ. Yes, as a tool, this book will aid you in answering this call to repentance and restoration. But please note: I am not just trying to sell “my” book. Rather I am presenting it as a means to assist you in your walk with Jesus. This book is available from Amazon.com, barnesandnoble.com, iTunes/iBooks or from me. I am able to get group discounts for printed versions if you order soon. For group orders I can be reached at michaelr05@msn.com or 970-245-0913. Whatever means or tools you use, at the very least, join us in prayer and fasting for our nation and the church in the month of October. Peace to you through our Lord Jesus, the Prince of Peace.